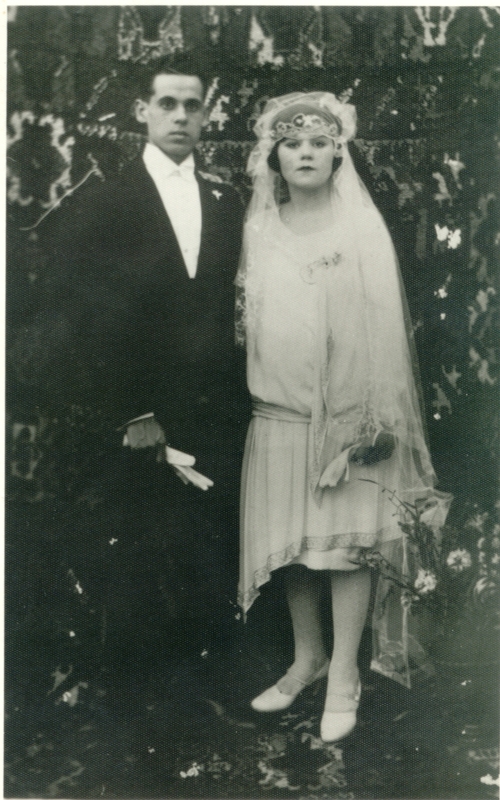 I love this photograph of my maternal grandparents, Esther and Ruben, on their wedding day, 1927 Morocco. I am especially intrigued by the contrast between their fashionable European dress and the Moroccan carpet in the background. Esther gave birth to sixteen children (!) out of whom only nine reached adulthood, she died giving birth to her sixteenth child, who did not survive as well. This picture captures a promising innocent moment for the newly weds. ****This post was not entered to the contest, but I still wanted to share one of my favorite family photographs with the readers of Pins & Needles. This entry was posted in My Family Portrait, Uncategorized. Bookmark the permalink.